Jairam Ramesh will take questions in a live Google hangout today. Live blogging the highlights of the discussion. Jairam Ramesh says, "In 2009 we did not promise right to health as we are promising in 2014." "India is a peculiar country," Jairam Ramesh says, "You are damned if you clear projects, you are damned if you don't. "Even though we have delivered a 8.5% rate of growth in the first five years, there has been a slow down in the last two year," says Jairam Ramesh. 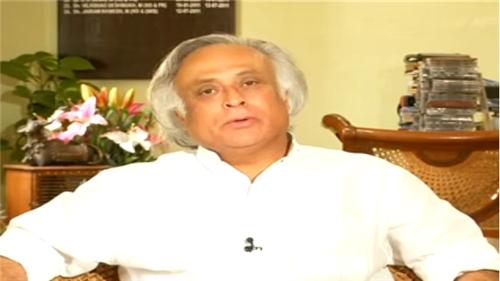 Jairam Ramesh says there has been enormous expansion in higher education. "Unemployment in our country is largely educated unemployment. But as economy picks up the absorption of graduates will increase," says Ramesh. Do you agree? "When we deliberate and take time to deliver thing it is called policy paralysis. When we do it hastily it is a poll gimmick. This is unfair," says Ramesh. "The Election Commission cannot be a parallel government," he says. "In todays mahaul created by the media, no government wants to be on the side of risk taking, but be on the side of caution," Ramesh says. "We are asking for mandate for a party and not one particular candidate," says Ramesh and adds, "Our system is not a presidential system. It is a party based system." "Negative and obstructive attitude of Yashwant Sinha has stopped the Aadhaar programme. They have torpedoed the Aadhaar programme," says Ramesh. Jairam Ramesh says that the Congress is not appeasing the minorities but only protecting them. "In out country secularism means respect for all religions. Secularism is fulfilling constitutional obligations. In our country secularism does not mean irreligion, but respecting all religions," says Ramesh. When asked if Congress will come to power Ramesh said, "We proved the prophets of doom wrong in 2009, and we will prove them wrong this year as well. Gujarat shining will meet the same fate as India shining."